Latest ProDemand Update: Take an Online Tour! We’re excited to announce that we’ve just introduced Online Tours in ProDemand, a new tool to help you navigate faster through the many resources in the product. These tours are more interactive than training videos, helping you master navigation by guiding you through tasks in real time as you use ProDemand. Here’s how to get started with Online Tours: Upon logging into ProDemand, you will now see a “How do I?” link on the home page, as well as a question mark icon in the top right of the screen. By clicking these links, a menu opens offering feature tours, training videos, and links to other support resources. 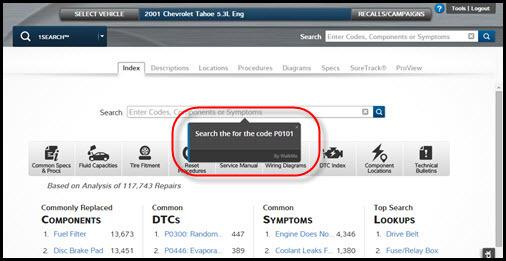 As you navigate within ProDemand, the online tours will guide you through tasks such as navigating 1Search by performing a code lookup. The Online Tours are very interactive, helping you while you’re actually performing tasks in ProDemand. Initially, we offer four online tours in ProDemand, each taking approximately two minutes to navigate through and complete. 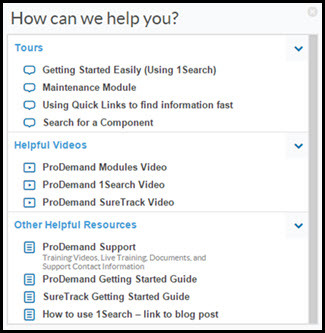 In addition to the tours, other Help content is available in the same menu, including links to training videos, getting started guides, and support pages. Also check the ProDemand Get2Know training center for additional support resources.